What is an Adopt-a-Storm Drain Program? An Adopt-a-Storm Drain program is an effort to restore urban and suburban streams by looking upstream to where water enters the stream system. Unfortunately, urban streams are not pristine environments and much of their water comes directly from roads and sidewalks through storm drain pipes. An Adopt-a-Storm Drain program accepts this reality and works to clean streams by keeping the storm drains that feed them free from litter, leaves, and debris. 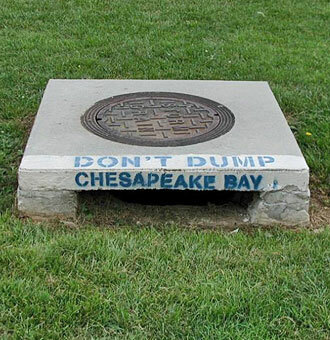 It may also help reduce illegal dumping and keep degrading substances such as oil, grease, and car soap from entering our stormwater drainage systems and ending up in our local waterways. The program is designed to recruit public and private partners to take sustained action to keep storm water drains clear and clean. An Adopt-a-Storm Drain program incorporates the storm drain marking activity from the fall section of ICPRB’s W.A.T.E.R., but it is more long term and requires a larger commitment from those involved. An Adopt-a-Storm Drain program might begin when volunteers mark their drain―from that point on they are agreeing to be a steward of that storm drain―keeping it clean and free from debris. Why Should I Start an Adopt-a-Storm Drain Program? 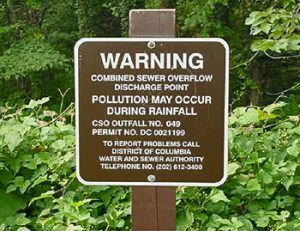 Many people unknowingly believe storm drains connect to sewer treatment systems. But in most communities whatever enters the drains is discharged directly into a neighboring body of water. That is often a local stream, lake, or bay. 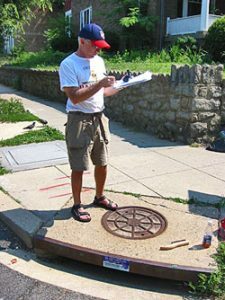 An Adopt-a-Storm Drain program benefits the Potomac’s waterways by making residents aware of their street’s connection to the local waterway through drain stenciling and it involves local residents in keeping their storm drains clean to stop pollution before it reaches their local waterway. 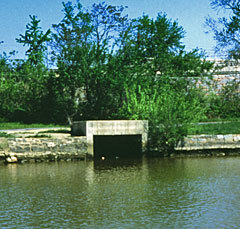 Like storm drain marking, adopting a storm drain works to raise citizen awareness of their waterway. In one study, more than 75 percent of the people who had seen the stenciled drains knew where their water went, compared with about a third of those who had not seen a stenciled drain. Unlike storm drain marking, adopting a storm drain also empowers citizens. An informed citizen may stop taking actions that impair local waters, but an empowered citizen actually takes positive actions on behalf of their stream. They are likely to work not only on this project but also on other restoration projects and speak out on behalf of their local waterway. In addition to benefiting the local waterway, an Adopt-a-Storm Drain program also benefits local neighborhoods. It helps create litter-free, more attractive communities, which in turn helps deter unwelcome illegal activity. It also enhances urban quality of life and increases economic development. An attractive, clean community is a great asset in attracting new businesses, jobs, and customers. As with any project, your goals and budget are closely related. A limited budget will certainly restrict what you are able to accomplish. The good news is that an Adopt-a-Storm Drain program can be done very inexpensively! You may be targeting a single neighborhood where trash and illegal dumping has been an issue or you may be targeting a watershed that is home to pollution-sensitive species. You might be interested in getting local businesses involved in restoring their local stream or you may be working with homeowners. Whatever the case, you will want to write out your specific goals and let them guide your work plan. The majority of the cost associated with an Adopt-a-Storm Drain program can come from the cost of marking or stenciling the storm drains. The cost of stenciling 100 storm drains is about $150.00 ($1.50 each) where the cost of marking them will cost about $350.00 ($3.50 each). For more information on the difference between a stencil and a marker and their budgets, please visit the storm drain marking activity from the fall section of ICPRB’s W.A.T.E.R. Additional costs depend on how the program is run. If you would like to provide your storm drain adopters with their supplies, the additional costs can amount to approximately $50 per volunteer (a volunteer can agree to care for one or several storm drains). If those adopting their storm drain are asked to provide their own equipment, additional costs will be zero. Maintaining a website that tracks the storm drain adoptions may be an additional fee. Check with your local water utility or government agencies to see if they might be willing to host the website for free. It may not be difficult to find grant funding for an Adopt-a-Storm Drain program. Done correctly, a large amount of matching money should be available because volunteers will be spending their time caring for the drains and even more match can be included if they provide their own tools. Additionally local municipalities might be able to lend support in the form of supplies or funding. You may also be able to defray costs by seeking donations by adopters. This both cuts costs and helps give them a sense of ownership. Some localities and non-profit organizations (such as the Chesapeake Bay Foundation) provide stencils or markers free-of-charge to groups interested in installing them. Also check with your local Department of Public Works or Department of Environmental Protection to see about partnering with them to put together this program. Developing an Adopt-a-Storm Drain program is not difficult, but like most programs, a fair amount of work must be done beforehand or behind the scenes before results are seen. Turn in information on locations of adopted storm drains to local government and report the compiled results of their work. The very first thing to do when considering an Adopt-a-Storm Drain program is to contact your local government agency or agencies charged with caring for the storm drain system and your local streams. Work with these agencies to develop the program, to determine trash and illegal dumping hotspots, and to use this information to determine focus neighborhoods or sub-watersheds. After you have selected the locales where you would like to work, contact the area’s neighborhood and business associations to let them know about the program and to get their permission and cooperation. At this point, you should work with your partners to develop brochures, flyers and/or door hangers that describe the program and ask for volunteers. Try to make the materials unique to the neighborhood and audience you are trying to reach. For example, if your audience is local businesses, talk to them about how their work could help attract new customers and improve sales, or if the neighborhood includes a Hispanic population, you may want to translate your materials into Spanish. Make your materials appropriate for the method of delivery. If you will be going door-to-door, a door hanger is best. If you are going to be handing materials out to individuals, a brochure or flyer might be a better route. When developing the outreach materials be sure to include either an application form or a phone number or email so that potential volunteers can contact you. After your materials are created, it is time to get them out in the targeted area. The best approach is to go door to door to recruit volunteers, however if you do not have the time or manpower to do this, deliver the information as best you can and to as many residents as is possible. Most streets will have at most two storm drains per block, so you should be able to find a volunteer for the work. Before going out into the target locale create a spreadsheet and/or map of the area and mark or note the location of all the storm drains. As volunteers agree to adopt their storm drain add their contact information to the spreadsheet and/or map to track which ones have been adopted. As people adopt their drains, work with them to install a storm drain stencil or marker (see Storm Drain Marking section). It may be most convenient for you to do the installation on a case by case basis, or you may want to go out and mark all of the storm drains on the same day. The benefit to doing them all at once is that it creates a story for the press and a photo opportunity. The drawback is that it requires more planning than working with individuals. After getting an Adopt-a-Storm Drain program going, you cannot leave it to run itself. Volunteers will need reminders for them to do their work. Follow up with them by email or a phone call until their work becomes a habit. Also contact them regularly to track the work that they have done. Their volunteer hours can be a valuable source of volunteer match for your organization so be sure to track it. You also need to follow up with your adopters to make sure that they are still living there and that they will continue to do their work. If they have moved or are no longer willing or able to care for their drain you need to find a new volunteer. The good news is that in some cases volunteers find someone to replace themselves, making your job easier! Finally, storm drain markers have a limited lifetime. Go out and check on your markers to make sure that they are still in place and readable. Replace or repaint them as needed.